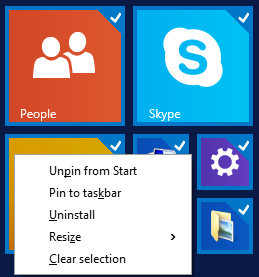 The ability to select multiples apps or multiple tiles on the Start Screen and Apps View of Windows 8.1 with Update is useful when you want to perform certain tasks or operations, such as when attempting to uninstall multiple apps and wanting pin many apps to Start Screen or Taskbar. Press and hold Ctrl key, and then click or tap on the tiles or apps which you want to multi-select one by one. A tick will be shown on the top right corner of the select tiles. Several common tasks can be performed on multiple selected app tiles, where all the options available can be displayed by right clicking on any of the selected tiles to bring up the corresponding context menu. Note that all all commands are available at the same time. Only allowed commands that are applicable to the all selected tiles are shown. Once a command is selected, it will be carried out and applied to all selected tiles.